The word ‘envy’ is applied in many places and is used in connection to various things – envy of another’s good fortune, being disturbed at seeing the wealth of others, displeasure and jealousy etc. are some of the various examples. Wherever the word ‘matsarya’ (envy) has been explained in the Vaisnava scriptures, it is fully understood that its influence is the competitor of divine love (prema). In these words of the Srimad Bhagavatam, it has been revealed who is eligible to receive the highest conception of dharma. In the scriptures, it is indicated that prema-rasa is the topmost dharma. One who is non-envious is eligible to receive that. The quality of non-enviousness is called nirmatsarata. Although respected commentators have explained matsarya as feeling miserable at seeing the happiness of others and taking pleasure in the sufferings of others, nevertheless, they have not revealed the broader meaning of this word and the general populace cannot understand it. "O mighty armed Arjuna, knowing that individual unit of consciousness to be superior to the intelligence, steady the mind with firm intelligence and conquer this indomitable enemy in the form of lust." Considering the jiva as fully spiritual, beyond intelligence, with determination and through proper siddhanta, by subduing the mind, one must conquer the formidable enemy of lust. 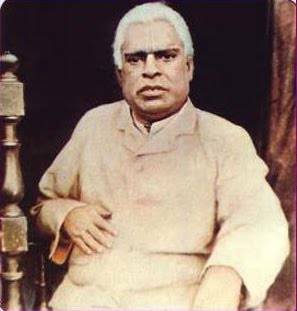 From all of these instructions, it can be understood that this sprout of lust, arising due to the misconception of one’s own svarupa, in due course of it’s development, becomes transformed into the tree of enviousness, and thereby the dharma of the jiva, which is prema, remains inapproachable. There is lust in anger, and in greed there is anger as well as lust. In illusion there is anger and lust. In madness there is greed, anger and lust. In enviousness there is madness, illusion, greed, anger and lust. We may understand that the word ‘mada’ (insanity) refers to the six types of bewilderment which includes being intoxicated by one’s beauty, one’s caste, one’s education etc. One who is devoid of envy cannot have false pride due to wealth, material beauty, caste, education and material strength; therefore he knows himself to be lower than a blade of grass. A non-envious person cannot be dominated by anger and cannot be envious towards others; therefore he is more tolerant than a tree. In other words, he is most munificent. Being devoid of all false conceptions due to caste, education etc. a non-envious person becomes endowed with all good qualities and thus has no desire for name and fame. Thus he never expects any respect for himself. An non-envious person finds happiness in the happiness of others and is sad at the miseries of other; therefore he gives proper honour to all living beings. Generally, with mercy he shows respect to all jivas; with proper honour he respects the brahmanas; he appropriately satisfies those within the cultured section of society who have become somewhat inclined towards Vaisnavism, and he serves the lotus feet of the Vaisnavas. 1) Does not make offences to sadhus. 2) Does not consider the demigods to be independent, for his intelligence is absorbed only in Krishna, yet he does not disrespect them. 3) Shows appropriate respect to the spiritual preceptors. 4) Appropriately honours the bhakti-sastras which includes the srutis etc. 5) Gives up unnecessary arguments and develops the faith that nama and nami are non-different. He considers the Holy Name as the highest worshipable reality. 6) Does not engage in sinful activities on the strength of the Holy Name. 7) Does not consider pious activities such as dharma, vows, austerities etc. to be equal to the Holy Name. 8) Makes an effort to develop faith in the faithless, but does not instruct them about the Holy Name until that faith has awakened. 9) Has complete faith in the glories of the Holy Name that is described in the sastras. 10) Does not identify himself with material conceptions. 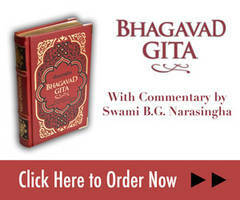 Endowed with full faith and devotion, listen to the lifework of Sri Caitanya... Cast aside envy and let your mouth sing, Hari, Hari!